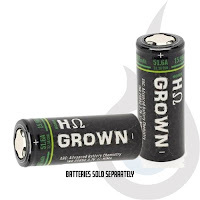 Hohm batteries are some of the highest-quality batteries currently available on the market of vaping supplies. Whether you prefer the Hohm Grown 26650, the Hohm WORK 18650 or the Hohm LIFE 18650 battery model, you can rest assured that you're choosing a top-notch power source. The Hohm Tech brand is well known for producing products with strong and lasting performance no matter how you vape. Its batteries can satisfy vapers who need higher-wattage setups or who run hotter coils as well as vapers who want an extra boost of power without sacrificing capacity. Each battery comes with a unique authenticity code attached, and all of the product materials are sourced from renowned providers, which ensures that you get an intense performance each time you use the battery. 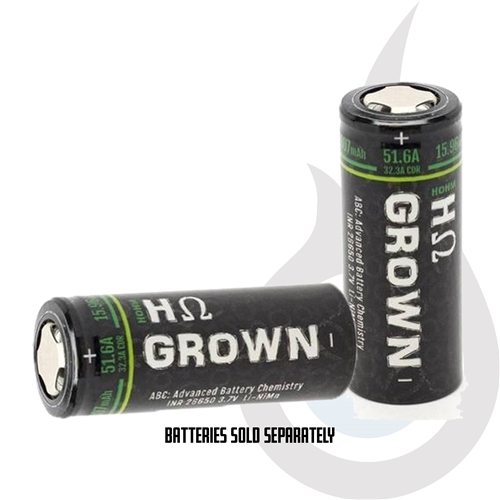 Hohm batteries also come with a lowered internal resistance that is made possible by several internal modifications that are unique to the brand. For vapers, this means that you'll get the performance you've come to expect from the Hohm brand when you need it. The batteries feature a rechargeable design that lets you get more use out of them, and this makes them a more cost-effective option as well. If your device takes more than one battery, you do want to replace both of them at once to get the most life out of the set. The Hohm LIFE and Hohm WORK batteries come with several industry-leading safety standards and testing hours in place to protect their customers. In addition to construction with more durable materials like cobalt and nickel, they also come with an updated poly seal. This updated seal enhances the Hohm battery's output and operation capabilities for a more powerful experience. You also get enhanced positive thermal coefficient (EPTC) rings in each battery, and these act as an added safety feature that helps to reduce and regulate the thermal potential in the battery. In turn, this stops the batteries from getting too hot and leaking inside of your device as you use it, even with extended use. Finally, these batteries have gone through thousands of tests to maximize their longevity and power output while retaining the cost-effective and safe status that vapers have come to expect from the Hohm brand. The Hohm LIFE and Hohm WORK 18650s are some of the safest 18650 batteries for vaping. Or check out the Hohm Grown for the best 26650 battery for vaping in the 26650 size, with no shortcuts taken when it comes to safety. If you're looking for a battery that is superior to the competition in power, safety, performance and cost-effectiveness, you have to try the Hohm brand. Its batteries’ revolutionary design and staying power make them a high-quality option you want to check into to help improve your vaping experience.